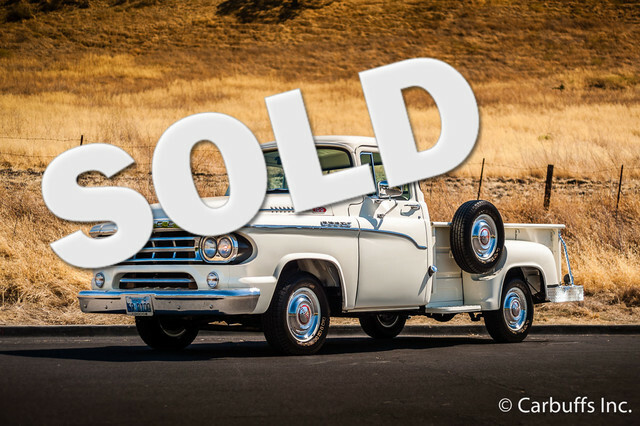 1 owner truck with only 450 miles since a full frame off restoration of the body, frame and interior. Approx. 20k miles on the 318 engine and 4 speed transmission. Original paperwork and photos from 1959. – Seller purchased special order truck new January 12, 1959 – Frame-off restoration with objective to restore to as delivered – Many factory optional items – 1st year for the 318/205 HP V-8 engine – 4-speed transmission – Full traction differential – 1 quart oil filter and oil bath air cleaner – Heavy duty instrument cluster – Factory Sun tachometer – Chrome all replated – Long bed 90″ on 166″ wheelbase – White oak bed with chrome strips – Door panel and seat upholstery match original. Runs and drives excellent. Currently registered with a clean California title.